Butter is probably the most frequently used dairy product in classic cooking and baking recipes, but it isn't great for everyone's health, whether due to a dairy allergy or the need or desire to cut saturated fat. People with a milk allergy will need to eliminate butter since the protein in milk called casein can be allergenic and is present in butter in small quantities. For those with a lactose intolerance, butter may cause a negative reaction as it contains lactose. And those trying to lose weight or promote heart health may choose to cut butter from their diet—butter is high in fat and calories, and the saturated fat may raise cholesterol levels. No matter what reason you have for cutting butter out of your diet, finding a substitute that cooks just as well and tastes similar can be challenging if you don't know what to look for. 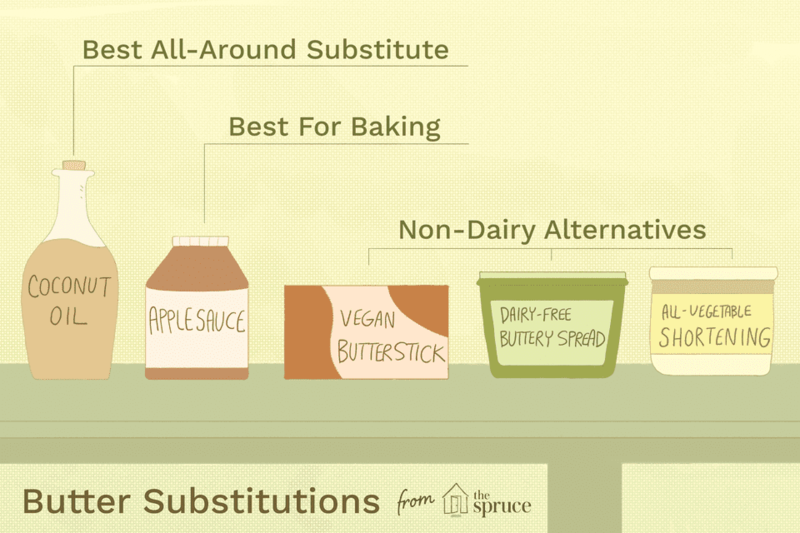 Fortunately, many of the best dairy-free butter alternatives—for spreading, cooking, and baking—can be found at health food stores and large grocery chains alike. First, it's important to understand which part of the butter is problematic when choosing your substitution. If you're lactose intolerant then choosing a dairy-free butter might suit your needs. However, if you're looking to cut saturated fats from your diet, then coconut oil would be a better choice than either butter or margarine. If you want to keep just one ingredient to substitute for butter it should be coconut oil. Coconut oil is great for use in just about everything, from baking to stove-top cooking to spreading on toast. It's healthy, rich, and tastes delicious. It cuts down on saturated fats and won't change the flavor of food too much. It is also a healthier alternative to canola oil. Some great brands to look for are Nutiva Organic Extra Virgin Coconut Oil, Crisco Organic Coconut Oil (refined and unrefined), and Carrington Farms Coconut Oil. Besides making everything delicious, butter has specific functions in baking. Some recipes, like butter cookies, rely on the butter for a flavor, but in many recipes, butter is being used to add moisture and texture, and to help create flaky layers. Butter is also a leavening agent, making the final product light and fluffy. Without butter, baked goods would be dry, flat, and without flavor. With some clever culinary substitutions, however, it's easy to get the results you seek without adding all the unhealthy fat from butter. When it comes to baking, as long as the butter isn't being used primarily for its flavor (like in puff pastry), you can usually swap it out with something that has a similar fat-to-water ratio. If you're looking to cut calories and saturated fats, these substitutes are a great start. Baking without butter is a fun way to make your baking habit a little healthier. There are a few foods that can be used as an equivalent to butter in baking recipes. Just keep in mind that most of these have a higher water content, so cutting back a little on the other liquids or adding a bit more flour will balance that out. One popular substitution is applesauce—because of its sweetness, though, you will want to add less sugar than the recipe calls for. Mashed banana will also work in place of butter, as does avocado. Both add nutrients but the avocado may impart a green tint to the finished product—it's best to hide this in a chocolate recipe. Greek yogurt will give your baked good a creamy texture and a little tang, while nut butters add a nuttiness but can make the baked good denser. So better to go with an alternative stick-butter substitute. Brands to look for are Earth Balance Vegan Buttery Sticks and Melt Organic Vegan Butter Sticks, both plant-based and made to taste like butter. Blue Bonnet Lactose-Free sticks are made with vegetable oil and are dairy-free and gluten-free, and have the "same great taste as Blue Bonnet." There's nothing like a warm piece of toast spread with soft butter—but can you get the same results with a non-dairy spread? Luckily, there are several brands that have figured out how to create that smooth texture and buttery taste without the dairy. Earth Balance makes six buttery spreads, including original, organic whipped, olive oil, soy-free, omega-3, and organic coconut spreads. All can be used for spreading, sauteing, frying, and baking. Smart Balance also sells several varieties, from original, organic, flaxseed oil, omega-3, EVOO (extra virgin olive oil), and low sodium as well as light versions. Shortening is an even fattier form of butter. Where butter is made with about 85 percent fat and 15 percent water, shortening is 100 percent fat. For those who can't tolerate lactose, there are a few dairy-free versions of this ultra-rich spread, including Crisco All-Vegetable Shortening, Spectrum's Organic All-Vegetable Shortening, and Nutiva Organic Vegan Shortening.